Benefit Cosmetics Singapore has an Achieve Hervana contest going on. 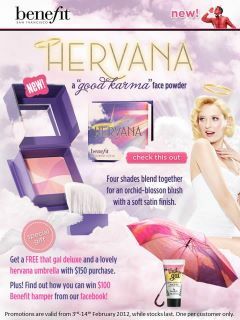 Post a photo of your Hervana makeupper or feedback at Facebook www.facebook.com/BenefitCosmeticsSingapore and stand a chance to win $100 Benefit Hamper. (3 hampers to be won) Valid at TANGS Orchard, Takashimaya, Robinsons Raffles City and Sephora ION from 3 to 14 Feb 2012. Burberry Beauty Spring Collection 2012 will be featured by a workshop with renowned makup artist, Ms Celestine Sng in a workshop. 18-19th Feb 2012, 11am to 1pm, 2.30pm to 4.30pm, 6pm to 8pm, at Tangs Orchard L4. Registration fee is $50 but fully redeemable for Burberry Beauty products. Call 68865516 or visit Burberry Beauty counter at Tangs Orchard L1 to register. Singsale is having a Smashbox sale for up to 40% OFF. Metro offers a few valued sets and some awesome GWPs in The Metro Big Sale. Check out the brochure below for details. Beauty.com offers new gifts with purchase from Borghese and Pop Beauty. Beauty.com offers free Lavanila laboratories Lip Shine and Scent Duo with any $10 purchase. Beauty Habit offers $10 off $50 or more purchase. Enter code BEMINE at checkout. Valid till Feb 14. Bliss offers free shipping and a free gift valued at $55 with $75 purchase. Free gift includes a full size Fabulous Foaming Face Wash, travel sizes of Lemon+Sage Soapy Suds and Lid and Lash Wash, and packette samples of Ingrown Eliminating Pad and Remede Sweep. Enter code LOVELY at checkout. Valid till Feb 29. Clarins offers free deluxe samples of One-Step Gentle Exfoliator and Wonder Perfect Mascara with $35 purchase. Enter code SPRING at checkout. Valid till Feb 8. Choose three extra free deluxe samples at checkout. Clinique offers free shipping with $30 purchase. Enter code INTENSE at checkout. Choose one extra free deluxe sample at checkout. CosMedix offers a free Pur Minerals Pout Plumping Lip Gloss in Rose Zircon ($16 value) with $35 purchase. Enter code HEARTLIPS at checkout. Valid till Feb 4. H2O+ offers buy 2 get 1 free for all skincare. Add 3 skincare products to your cart and the cheapest one will be free. Valid till Feb 11. Jurlique offers a new valued set worth $65 on sale for $45. The Bouquet of Roses set includes 40ml of Rose Hand Cream, 100ml Rosewater Balancing Mist, 15ml Rose Love Balm, and a complimentary beauty bag. Korres offers a free deluxe sample of New Pomegranate Mattifying Treatment with any $50 purchase. No code needed. Lancome offers free shipping and four free deluxe samples valued at $83 with $45 purchase. Gifts include 60ml Creme Radiance Cleanser, 7ml Genifique Concentrate, Hypnose Drama Mascara, and a mini Juicy Tubes in Berry Bold. Enter code FEBLANCOME at checkout. Valid till Feb 29. Choose one extra deluxe sample at checkout. Laura Geller offers 20% off all Air Whipped products. No code needed. Valid till Feb 7. Lord and Taylor offers a free small box of Godiva truffles with $75 frangrance purchase. No code needed. MAC Cosmetics offers free shipping with any purchase. Enter code NEWS at checkout. Valid till Feb 5. Sephora offers a free deluxe sample of Smashbox Camera Ready BB Cream SPF 35 with $25 purchase for Beauty Insiders. Enter code SMASHBB at checkout. Sephora offers a free brush roll with purchase of any three Sephora Collection Pro Brushes. Enter code PROBRUSH at checkout. Time to Spa offers free shipping and a free four piece gift valued at $75 with $75 purchase. Free gift includes 50ml Rehydrating Rosepetal Cleanser, 50ml Rehydrating Ginseng Toner, 15ml Pro-Collagen Quartz Lift Mask, and 14 Cellular Recovery Skin Bliss Capsules. Enter code LOVEMYSKIN at checkout. Valid till Feb 29. TheraBreath's offers up to $157 in free products and free shipping with purchase of bonus pak.